About 15 to 30 whitetails inhabit each square-mile where you hunt deer. Likely eight to 11 are 2-1/2 years of age or older, three to five being bucks and five to six being does. The rest are fawns and yearlings. Why then is it so difficult to spot one deer 2-1/2 years of age or older while hunting, especially a mature buck, much less get an easy shot at one? 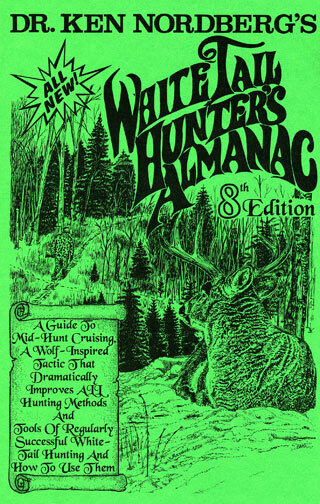 If you are like most whitetail hunters these days, one to four shortcomings can be blamed: 1) the belief you can get close to whitetails without them realizing you are near, 2) the belief your favorite hunting method is regularly productive for taking any class of whitetail, 3) the failure to realize how experienced adult deer routinely avoid you and/or 4) a lack of patience. Consider number one. Certain wild predators regularly consume venison. The one I am most familiar with is the gray wolf (or timber wolf). Most healthy adult deer can outrun wolves. Therefore most deer killed by wolves were slowed for some reason: being a fawn less than five months old, being olda deer more than six years of age slowed by arthritis and/or disease, being wounded, being weakened by starvation in late winter and/or floundering in deep snow. However, even while cooperatively hunting in packs (November through spring snow melt, during which time surviving fawns are now also capable of outrunning wolves), packs are only successful at killing a whitetail in about one in five attempts. Unlike wolves that use their teeth to kill deer, we humans use firearms that enable us to slay deer considerable distances away. Nonetheless, more than 90% of whitetails taken by American deer hunters each fall are inexperienced fawns and yearlings. Obviously, long-range firearms provide no significant advantage when hunting experienced deer 2-1/2 years of age or older. It is also obvious few deer hunters are capable of regularly stalking within easy shooting range of older whitetails without them knowing it. Doc's son Ken, and grandson Ryan. That middle 8-pointer is the same buck shown above. Ken shot all three of these 8-pointers in 2012in the first few days of the season. Is this simply luck? Absolutetly not! 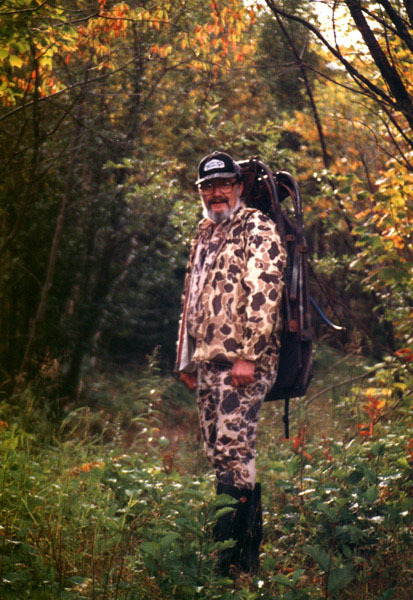 Simply put, Ken is one of the deadliest buck hunters in the world. and he never uses traditional drives or stalks! In time, we hunters may come to believe we have such a capability because we do occasionally jump (unexpectedly encounter) mature bucks or does short distances away. Unfortunately, realization only occurs while a jumped deer is bounding noisily away with all possible speeda very difficult target. In almost every case, however, such an encounter occurs because the deer thought it was unnecessary to move, the hunter obviously unaware of its presence and moving in a direction that assures it will pass a safe distance away. The jump occurs when the hunter suddenly halts a short distance away, seemingly (but not really) becoming aware of the nearby deer, or unexpectedly turns and moves toward the deer. Stealth or any other assumed hunting skill has nothing to do with it. We humans are not nearly as stealthy as wolvesthe world's most successful whitetail huntersand even wolves find it very difficult to stalk near experienced adult deer undetected. But as long as you believe you can do it, you'll keep moving, expecting to jump a deer eventually. Your odds for taking an older deer will be very poor, however. A sneaking deer hunter who often pauses to peer about and listen is one of the easiest of all hunters for experienced adult whitetails to identify at safe ranges and easiest to avoid. Keep in mind, well before we are in sight, experienced adult whitetails readily recognize the sounds we make, which are unlike sounds made by all other creatures they are familiar with. While within sight, these deer readily recognize our upright bodies, striding on hind legs only. Our short necks, hairless faces and wide shoulders also make us totally unlike all other creatures seen within their ranges. Whether clinging to objects along the trails we have recently traveled or airborne, experienced whitetails also readily recognize the more than 100 odors emitted by our bodies, clothing, boots, firearms and all the other stuff we carry while hunting. All our odors are totally unlike odors emitted by all other creatures whitetails regularly encounter. Therefore, unless a strong wind is blowing, moderate-to-heavy rain or wet snow is falling and you are traveling into the wind or crosswind, there is no way you can get close to experienced adult whitetails without such deer knowing it. 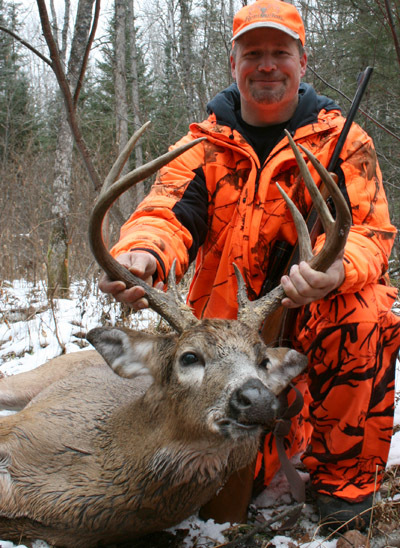 Whatever your favorite hunting method, to be regularly successful at hunting mature whitetails, your method must make it extremely difficult for whitetails to identify you, and subsequently avoid you. 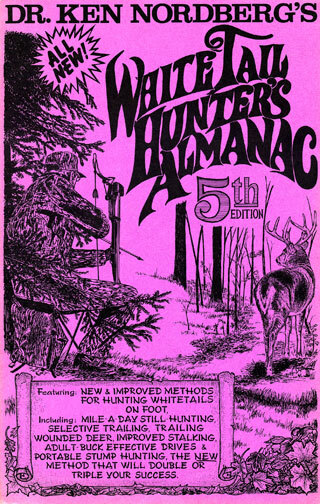 No hunting method is 100% successful in this regard but at least one method is proven superior to the others: the wolf-inspired form of stand hunting I refer to as portable stump hunting (see ad below). Admittedly, hunters making drives take a lot of deer no matter what the weather, but drives are not particularly productive for taking whitetails 2-1/2 years of age or older. Moreover, areas where drives are made are generally ruined for subsequent hunting for a period of one to two weeks or more. Still-hunting should be a relatively productive hunting method, but most hunters these days omit the still part, wandering endlessly, only occasionally pausing briefly along the way. Like sneaking stalkers, still-hunters are routinely identified and avoided by experienced adult deer, usually without the hunter's knowledge. Today, stand hunters aren't much better off. Elevated stands and hunters using them are recognized within hours by experienced adult deer and thereafter avoided. When experienced adult deer hear, see or smell something that suggests a human might be near or approaching, they immediately quit what they are doing (feeding, watering, traveling or napping) and spend the next 15-30 minutes frozen (first moving silently to cover if deemed necessary), intently listening, watching and smelling, determined to positively identify whatever made the sound (likely a snapping branch or heavy or dragging footsteps). Whatever made the eye-catching movement several feet above the ground suggests something big is approaching, or whatever emitted the whiff of odor is mindful of a human. This is the point where taking a certain precaution for 30 minutes makes or breaks a hunt. Whereas it is nearly impossible for a human heading to a stand site to avoid alerting deer ahead that something is approaching, it is possible to make it very difficult for those deer to positively identify you. You can't be successful at this every time, but you can succeed often enough to become regularly successful at hunting mature whitetails. If deer ahead cannot be sure what you are during this period, they won't move away. After failing to identify you within 15-30 minutes, they'll finally give up and resume whatever they were doing. If you are upwind, however, you don't stand a chance. Positive identification will be certain and those deer will soon move away. While heading to a stand, your final 100 yards should be traveled with utmost stealth: picking up your feet and placing them down lightly and following a clean (silent) trail (an existing deer trail) through dense cover. If you expect to see deer near your stand sitefeeding, for examplehalt 50 yards or more from your stand site. Sit patiently until first light in the morning or until thirty minutes has passed in the afternoon. Then without the aid of a flashlight move as silently as possible to your stand. Whatever you are doing, sitting or moving, each time you hear something that might mean a deer is near (a soft twig snap, hoof beats, a grunt or bleat, a scolding squirrel or a flushing grouse, for example), freeze again for no less than 30 minutes, keeping head movements very, very slow. Then, to make it impossible for experienced whitetails to routinely avoid you, change stand sites once or twice daily. If youre still-hunting, plan to patiently sit 30 minutes at a time at sites where you expect to see deerplaces where deer tracks and/or droppings are very fresh. Such signs may be the only reason to take extra care for 30 minutes, but they are enough. Be patient. Never move from these sites until you have spent 30 minutes studying the area ahead, making as certain as possible you will jump no deer as you silently move to your next still site. 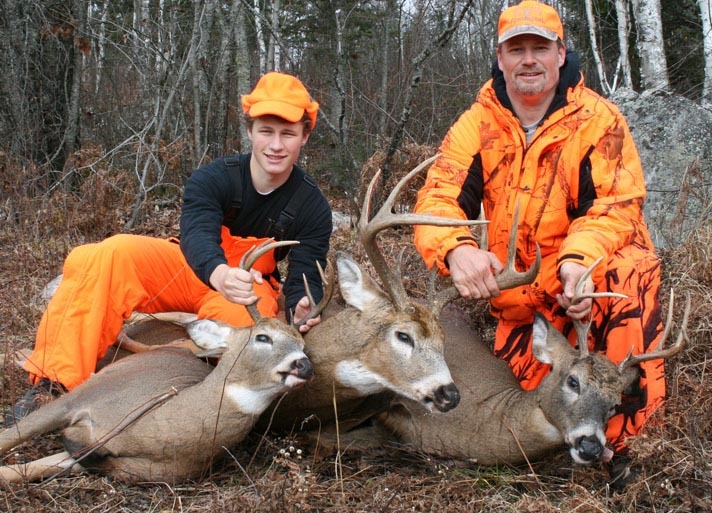 Whether a stand hunter or still-hunter, these properly spent periods of 30 minutes will make you much more difficult for all nearby whitetails to identify and therefore much more successful at hunting mature bucks or does. And, remarkably, most of your shots will be easy.